Perennial; caespitose. Rhizomes short; pachymorph. 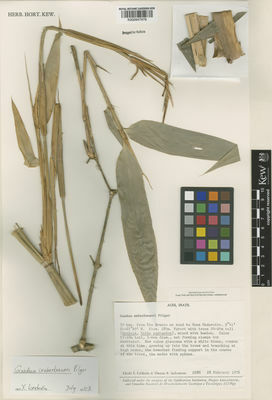 Culms erect; 1000-1800 cm long; woody; with root thorns from the nodes. Culm-internodes thin-walled. Lateral branches dendroid. Bud complement 1. Branch complement three; thinner than stem. Culm-sheaths without auricles. Ligule an eciliate membrane. Leaf-blade base with a brief petiole-like connection to sheath; petiole 0.5-0.6 cm long. Leaf-blades lanceolate, or elliptic; 13-17 cm long; 20-35 mm wide. Leaf-blade apex acuminate. Synflorescence bractiferous; scanty; with glumaceous subtending bracts; with axillary buds at base of spikelet; prophyllate below lateral spikelets. Fertile spikelets sessile. Spikelets comprising 3 fertile florets; with diminished florets at the apex. Spikelets elliptic; laterally compressed; 17-25 mm long; breaking up at maturity; disarticulating below each fertile floret. Rhachilla internodes obscured by lemmas. Glumes persistent; similar; shorter than spikelet. Lower glume ovate; 0.25 length of upper glume. Lower glume surface pubescent. Lower glume apex acute. Upper glume ovate; 0.5 length of spikelet; coriaceous; without keels. Upper glume surface pubescent. Upper glume apex acute. Fertile lemma ovate; 13-16 mm long; coriaceous; without keel; 9-13 -veined. Lemma surface pubescent. Lemma apex acute. Palea 1 length of lemma. Palea keels winged; conspicuously winged. Apical sterile florets resembling fertile though underdeveloped. Lodicules 3; veined. Anthers 6. Stigmas 3. Nativa en Colombia; Alt. 50 - 100 m.; Amazonia.